Georgy Toloraya is Director of the Asian Strategy Center at the Institute of Economy of the Russian Academy of Science and works for the “Russkiy Mir” Presidential Foundation as Chair of Regional Programs and CEO of the Russian National Committee on BRICS Research. He is also a professor at MGIMO (Moscow University of International Relations). Resume: The name Asia might be a misnomer by Ancient Greeks’ standards, but the homogenous nature of this area is quite visible. The territory to the east of the Ural Mountains from time immemorial was called by Europeans Asia. In fact it was the name of everything known in this erawhich was not Europe on the Eurasian continentfrom the Bosporus to Japan (up to the place “where the sun rises”). The term has become especially popular in economics and politics since the late 1980s due to globalization, as most of the nations within that area are emerging markets experiencing rapid growth. The APEC basic framework adds Pacific-facing Latin American nations to the region, with Australia and Oceania considered part of the APR as well. So it stretches all the way from the Arctic to Antarctica. Lately a construct of Indo-Pacific has emerged, supported by India and now enthusiastically embraced by the United States (in fact, this term was widely used by the U.S. Navy to describe the area of responsibility of PACOM, ignoring geographical and natural borders). It includes the Indian Ocean up to the coast of Africa and in fact covers the most of the Third World. As such, due to its civilizational, political, and economic diversity and poor logistical connectivity, countries in this Indo-Pacific area has little in common with each other and this area hardly deserves to be called a “region” at all. The reason for its introduction is widely believed to be the need to bring India into scheme to “encircle” China as a U.S. chief global adversary and to create QUADa union of “ocean democracies” against the totalitarian empire. These kinds of geopolitical constructs (and this may not be the last one-there are some in the Atlantic and Eurasia as well) in fact dilute the real problems of regional connectivity, joint efforts, and common regional fate. These “artificial regional” concepts also undermine the true meaning of regional cooperation and security, leaving all the “supranational” governance in the hands of existing global regulators. In the case of Asia that might not work. Asia proper is the heartland of unique ancient civilizations and long state history, unlike other parts of the globe. It also has a distinct cultural identity developed from a common mold. The regional problems in this area are real and multifold-territorial and political conflicts, natural and man-made disasters, epidemics, transnational crime, and economic integration issues. These problems, although part of the global agenda, can be most effectively solved within the region which has an established state structure, systematic international relations mechanisms and established regional international organizations. This area is quite distinct and separate. It stretches from Mongolia and Russian Far Eastern provinces in the North, to Indonesia and Papua New Guinea in the South, and from Myanmar in the West to Japan in the East . It is home to 2,261mln people (30% of global population), producing 21,468 billion U.S. dollars (27% of global GDP), generating 4,652 billion U.S. dollars (30% of global exports). The name Asia might be a misnomer by Ancient Greeks’ standards, but the homogenous nature of this area is quite visible. 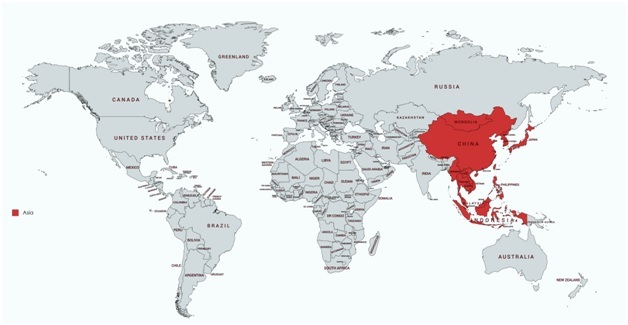 This “CORE ASIA” or “KERNEL ASIA” is the bedrock of regional identity, it has common racial, cultural, religious, and civilizational peculiarities, making “Asians” quite noticeable in any part of the world. Of course, there may rise a question, why Central Asia, politically and economically very much connected, is not included into Core (Kernel) Asia (this logic would suggest that even Tibet and the Uigur region, ethnically different from the Asian core, should have some different identity, although they are part of China). This is an issue for ethnographers and historians to discuss, but as of now these areas are more connected (not necessarily politically, but culturally and even logistically) with West Asia. In the mealtime the region should be clearly limited by national borders. What about other resident Pacific nations, like the U.S., Australia, New Zealand, Russia, and, say, Canada? They do have, of course, vital interests and established channels of interacting with the “Asian core” and even integrating into it. However, with all due respect, they are external partners and should be rule-takers, not rule-makers in the region. Of course, from the position of political realism, the U.S.’s and its military allies’ role will not suddenly disappear. But it is necessary to separate politics and military security from national identity and geography. Otherwise the logic of natural development would be substituted by political and strategic interests, not necessarily beneficial to the regional nations. The burning question is the “elephant in the room.” Does this concept mean that CHINA will naturally dominate this region? Not necessarily, especially now that “the Westphalian system of Asia” is in the making. On the contrary, joint rule-making can help control Chinese policy and make China respect other actors’ interests and concerns, providing for indivisibility of peace. There is also a strong established grouping, claiming the “driver’s seat” and “central role” in Asian affairs-ASEAN and the mechanisms created by it (ARF, ADMM+, EAS etc). The “CORE ASIA” concept may be much more appropriate for ASEAN than the “Maritime Southeast Asia” idea nurtured in certain quarters. ASEAN’s self-proclaimed “central role” in the Asia-Pacific community-building, much heralded since 1990s, has somehow been diluted due to new geopolitical tendencies. If the “CORE ASIA” approach is adopted, ASEAN and the ARF will have to concentrate on the efforts to work out some kind of region-wide security “code of conduct,” or “manual,” or “terms of reference” for Preventive Diplomacy which they can adopt on the official level as guidelines. These “guidelines” could serve beyond the ASEAN geographical scope as a norm-setting example in the whole of Asia Pacific or in other troublesome areas like Africa. Such efforts would bring in China and other influential regional players into coordinating policies and compromise-seeking and also help increase compliance. After all of regional nation-states have been “entrusted” with setting up rules without outside interference, China will have only one vote, while ASEANwill have ten. The word Asia originated from the Ancient Greek word Aσiα, first attributed to Herodotus (about 440 BCE) in reference to Anatolia or to the Persian Empire, in contrast to Greece and Egypt. Eventually, however, the name was expanded progressively further east, until it came to encompass a much larger land area with which we associate it today. One of the first classical writers to use Asia as a name of the whole continent was Pliny. Wikipedia contributors, “Asia”, Wikipedia, The Free Encyclopedia, https://en.wikipedia.org/w/index.php?title=Asia&oldid=828008507 (accessed March 5, 2018). Wikipedia contributors, “Asia Pacific”, Wikipedia, The Free Encyclopedia, https://simple.wikipedia.org/w/index.php?title=Asia_Pacific&oldid=5768484 (accessed March 5, 2018). A region is defined as “part of the Earth’s surface with one or many similar characteristics that make it unique from other areas. Regional geography studies the specific unique characteristics of places related to their culture, economy, topography, climate, politics, and environmental factors such as their different species of flora and fauna”. Wikipedia contributors, “Region”, Wikipedia, The Free Encyclopedia, https://en.wikipedia.org/w/index.php?title=Region&oldid=826436527 (accessed March 5, 2018).